Kathryn Brooke “Katie” McCloud, 25, died tragically on Friday, November 30, 2018. 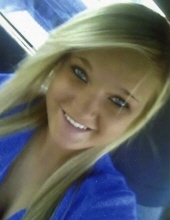 Katie was born in Goldsboro on December 5, 1992 to Stephanie Mackie Anderson and Richard McCloud. She was a 2011 graduate of Southern Wayne High School. While a student, Katie enjoyed being a part of Saint Sound and the tennis team. Katie Bear, as she was called by family and friends, had a contagious smile and outgoing personality that broke down barriers and opened doors to an exciting and fulfilled life. She was the life of the party. At her 21st birthday, Katie planned a Barbie party for herself and it was enjoyed by all. Early in life, Katie entered the pageant world where she displayed her beauty and talent. In 2001, she was crowned Little Miss North Carolina. Katie was always up on fashion and would love to express herself with her clothing, hair, and makeup. She was always the shining light wherever she went. Katie loved animals and especially her dog, Hershey. She was always a free-spirit that found the best in everything. This allowed her to live a very inspiring and meaningful life. Katie will be remembered by her family as a lot of dynamite in a little package. Those who met Katie could always see a smile on her face and could count on her kindness and unconditional love and friendship. Katie will be missed but will be greatly remembered. A service to celebrate her beautiful life will be held at 2:00 p.m. on Wednesday, December 5, 2018 (her 26th birthday) at The Bridge, Princeton Campus. Interment will follow in Evergreen Memorial Cemetery. The family will receive friends on Tuesday, December 4, 2018 from 5:00 – 8:00 p.m. at the home of Stephanie and Andy Anderson, 217 Creekside Drive, Goldsboro. Katie is survived by her mother, Stephanie Anderson and husband Andy of Goldsboro, father, Richard McCloud of Goldsboro; sisters, Melissa Bland Turner and husband Chris of Angier and Summer Scarlett McCloud of Goldsboro; brother, Braxton Allen McCloud of Goldsboro; maternal grandmother, Jennie Mackie; and paternal grandmother, Lois Bradley. She is also survived by her aunts, Robin Schearf, Suzie West and Deedee Coston; uncles, Terry McCloud and Allen Morris; and great aunts, Sue Griffith and Karen Askins (David Angeli). She was preceded in death by her maternal grandfather, Larry Mackie; paternal grandfather, Dale McCloud; uncle, Jack McCloud; aunt, Mary Morris; and special friend, Keith Evan Presnell. To send flowers or a remembrance gift to the family of Kathryn Brooke McCloud, please visit our Tribute Store. "Email Address" would like to share the life celebration of Kathryn Brooke McCloud. Click on the "link" to go to share a favorite memory or leave a condolence message for the family.